BACKGROUND: Routine use of frozen section (FS) is a costly procedure and sparsely available in resource poor countries. A proper cost benefit analysis may help to reduce its routine use and would empower surgeons to perform oral cancer surgeries without having FS facility. FS is performed to identify microscopic spread beyond gross disease that cannot be assessed clinically. OBJECTIVE: Our primary aim was to determine the cost benefit analysis of FS in the assessment of margins in oral cavity squamous cell carcinoma (OSCC). MATERIALS AND METHODS: Retrospective study of prospectively collected data of 1311 consecutive patients who were operated between January 2012 and October 2013. The gross and microscopic margin status of each patient was extracted from the patient's chart. The cost estimates were performed to calculate the financial burden of FS as well as expenses incurred on adjuvant treatment resulting from inadequate margins. RESULT: Microscopic spread changed the gross margin status in 5.2% (65/1237) patients. Of this entire cohort of 1237 patients, FS helped 29 (2.3%) patients to achieve tumor free margin, and it changed the adjuvant treatment plan in 9 (0.7%) patients. The cost of FS for each patient was INR 11052. The cost-benefit ratio of FS was 12:1. Gross examination alone could have identified majority of the inadequate margins. CONCLUSION: Frozen section for assessment of margin status bears poor cost-benefit ratio. Meticulous gross examination of the entire surgical specimen is sufficient to identify majority of inadequate margins. Although FS assessment is meant to detect microscopic disease beyond gross disease, there is hardly any literature on prevalence of such microscopic spread. In this study, we aimed to estimate the impact of microscopic spread on margin status following surgery. We evaluated the role of FS in identifying such microscopic spread and its cost-effective nature. Institutional ethical committee clearance was obtained for the study. Between January 2012 and October 2013, a total of 1,311 patients were operated for OSCC in a tertiary cancer center and a teaching hospital in India. The surgeries were performed by multiple surgeons with a wide range of experience in the field of surgical oncology (6 months to 25 years). Of these 1,311 patients, FS for the assessment of margin was performed in 1,237 patients. As per our institutional policy, instead of sampling from the surgical cavity, FS assessments were done from the entire specimen. FS was performed from the closest mucosal and soft tissue (if applicable) margin; and from any other margin if the surgeon/pathologist was suspicious. The margin status was documented as “involved” when invasive tumor or carcinoma in situ was present at the margin or within 1 mm of the margin; “close” when invasive tumor was present less than 5 mm but more than 1 mm from the surgical margin; “free” when invasive tumor was 5 mm or more from the surgical margin. Details of the histopathology report, adjuvant treatment plan, TNM stages, and operative notes were extracted from the patient's chart. The cost estimates were performed to account for financial expenditure on FS as well as that on adjuvant treatment (radiation and chemotherapy if required) as a result of inadequate margins. Activity-based costing analysis was performed to estimate the indirect institution-associated expenses for frozen sectioning, radiotherapy (RT), and chemotherapy. This calculation accounted for (i) Land and hospital building infrastructure: Rental value as per current market estimates; (ii) Electricity, air conditioning system, water, and gases; (iii) Ownership costs of various major and minor equipments in the hospital along with annual depreciation and maintenance costs; (iv) Wages of physicians, para medical, and support staff; (v) Running and maintenance of ancillary services such as waste management, sterile services, laundry, pharmacy, nutrition, administration, etc. All these mentioned parameters were applied as relevant and were calculated individually. For patients undergoing adjuvant treatment, we also accounted for the expenses associated with travel, food, accommodation for patient, and care-givers as well as their loss of productivity. Adding the direct-billed amount to indirect institutional expenses along with logistics expense and loss of productivity gave a conservative estimate of expenses associated with frozen section, chemotherapy, and radiation. FS was performed in 94.3% (1,237/1,311) patients. The clinical characteristics of these 1,237 patients are described in [Table 1]. Among 1,237 patients, 81.2% (1005) had free margins, 15.7% (194) patients had close margins, and 3.1% (38) patients had involved margins. Overall, 18.8% (232 patients) had inadequate (close or involved) margins in the main specimen. FS-guided intraoperative revision of margins led to adequate tumor free margin in 92.2% (1,141/1,237) patients [Figure 1]. Even after performance of FS in 1,237 patients, margins remained inadequate in 96 (7.8%) patients (71 close and 25 involved). In these 96 patients, FS failed to identify the inadequate margins in 70 patients (mucosal/soft tissue margin in 57 patients and bony margin in 13 patients). However, 26 of these 96 patients were reported to have inadequate margin on FS. Of these 26 patients where FS detected inadequate margins, 25 patients had close margins that were not revised intraoperatively. Operative notes of 7 such patients suggested the decision was taken to avoid significant morbidity (resection of bone or larynx) associated with revision. There was no specific reason found in the operative notes of the remaining 18 patients. In 1 patient, even the revised margin following FS was reported as “involved.” In this patient, no further revision was done because of the anatomical constraint. The interpretation accuracy of FS compared to final histopathology report (HPR) was 100%. 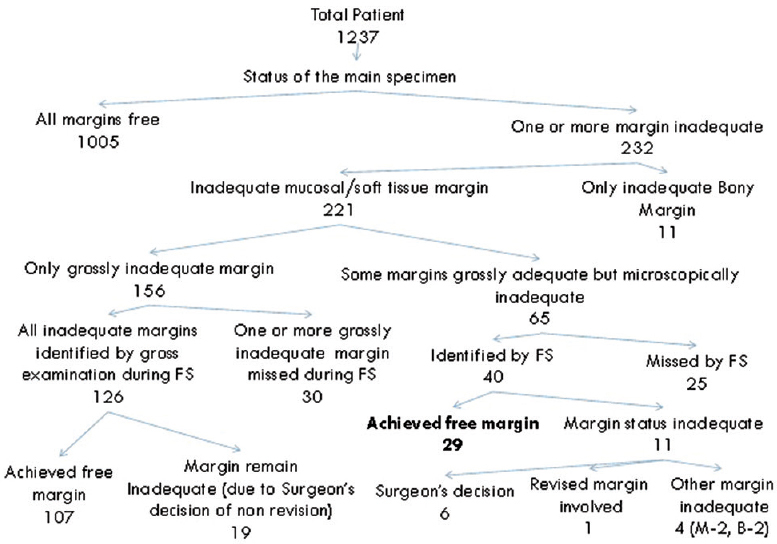 Considering the fact that FS missed 70 patients with inadequate margin, the accuracy of FS for assessment of surgical margin was 94.3%, with sensitivity of 69.8% and specificity of 100%. However, FS was performed only for mucosal and soft tissue margins and not for bony margins. Hence, the accuracy of FS for mucosal/soft tissue margin was 95.4%, with sensitivity of 73.7% and specificity of 100%. We studied the role of FS in identifying the microscopic spread that may impact the gross margin status. In these 1,237 patients, microscopic spread beyond gross disease was reported in 107 patients (8.6%). However, this microscopic spread changed the gross margin status in 65 patients (5.2%). In these 65 patients, 69 margins were reported to have microscopic spread that impacted final margin status. Of these 69 margins, microscopic examination converted 55 “grossly free” margins to “close” margins, 11 “grossly free” margins to “involved” margins, and 3 “grossly close” margins to “involved” margins. Despite microscopic spread beyond gross disease, margin status remains unchanged in 53 margins (Free to Free in 44 and close to close in 9) of 42 (3.4%) patients. Of these 65 patients where microscopic spread changed the gross margin status, FS identified such spread in 40 patients. After intraoperative revision, 29 of these 40 patients achieved tumor free margin, whereas tumor free margin could not be achieved in 11 patients. In 4 patients though the FS detected the close margin correctly and margin was revised. In the final HPR some other margin was reported as inadequate; in 6 patients, the inadequate margins were not revised even though FS identified them (no specific reason for non-revision was found in 5 patients; in 1 patient the revision was not done to avoid morbidity); and in 1 patient, the revised margin was also positive. Considering the fact that the primary aim of intraoperative FS is to achieve adequate tumor free margin, we calculated how many patients actually benefitted from FS. Of the 1,237 patients in whom FS was done, 1,005 patients had grossly adequate margin all around the tumor in the main specimen itself, which was subsequently confirmed during microscopic examination. Because no further revision of these margins was required, FS does not offer any benefit to such patients. In 232 patients, one or more margins were inadequate. FS-guided revision helped 136 patients to achieve free margin. Therefore, 11% (136/1237) patients benefitted from performance of FS. Of these 136 patients where FS seems beneficial, 107 (78.7%) had grossly inadequate margin (less than 5 mm) that was only reconfirmed by microscopic examination. Hence, these patients were not actually benefitted from FS as the inadequate margins were identified during gross examination. In 29 patients (21.3%), the margins were grossly adequate and microscopic spread changed the margin status to 'inadequate.” [Figure 1] Therefore, in the entire cohort of 1,237 patients, 2.3% (29) got benefit from FS. Activity based cost-benefit analysis was calculated. The actual cost of FS was calculated taking costing exercise of average two sections per specimen. The time consumed for each patient was calculated from the FS registry book, and average time per patient was estimated. 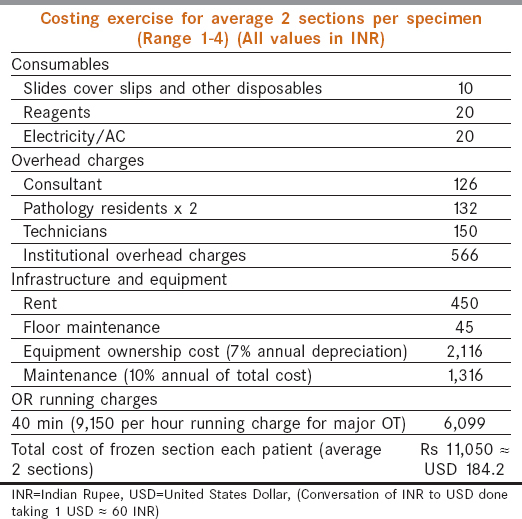 The cost of FS for each patient was INR 11052 [Table 2]. For 1,237 patients, the total cost of FS for the entire cohort was USD 227814.2 (INR 13668850). As mentioned above, only 29 patients actually benefitted from FS. Had the FS been not performed, these 29 patients would have ended up with inadequate margin necessitating additional requirement of adjuvant treatment such as concurrent chemo-radiotherapy (CT-RT) as per our institutional policy. In these 29 patients, from many other prognostic factors (extra-capsular spread, perineural involvement, thickness, T stage, N stage, etc), 17 patients received adjuvant CT-RT, and 5 patients received adjuvant RT. Of the 7 remaining patients, 3 patients were not offered adjuvant RT (despite its indication according to T stage, N Stage, perineural invasion (PNI), and not the margin status) because they had already received 60 Gy or more within the last 2 years. There were no indications of adjuvant RT in 4 patients, and if FS was not done, they would have required adjuvant CT-RT for inadequate margin alone. Therefore, performance of FS in these 29 patients did not impact the management of 17 patients who received CT-RT because of presence of other prognostic factors. Similarly, adjuvant treatment of 3 patients did not change despite FS because they had already received RT recently. The adjuvant plan of RT would have changed to CT-RT in 5 patients had FS not been performed; whereas 4 patients were saved from unwarranted adjuvant treatment (CT-RT) because of FS. Therefore, performance of FS actually impacted the adjuvant treatment plan of 9 (0.7%) patients in the entire cohort of 1,237 patients. However, FS changed the adjuvant treatment plan of 1 out of 137 patients. It saved the cost related to CT-RT in 4 patients and additional chemotherapy (apart from RT) in 5 patients. As explained in methods, the total costs for adjuvant CT-RT and adjuvant RT in our center were INR 225000 (US Dollar 3750) and INR 181000 (USD 3016.7) per patient, respectively. [Table 3] Hence, in the entire cohort of 1,237 patients, the performance of FS was able to save USD18666.7 or INR 1120000 [(4× cost of CT-RT) + (5 × cost of additional chemotherapy)]. The total cost of FS for this entire cohort was USD 227814.2 (INR 13,668,850) [cost of FS for 1 patient × 1237]. Therefore, the cost-benefit ratio was 12.2:1. The primary aim of surgery for any OSCC is to achieve adequate tumor-free margin. There is a lack of consensus regarding the definition, of “adequate margin,” but most centers, including ours consider microscopically 5 mm or more tumor free margin as adequate margin. There is a common perception that the tumor cells spread beyond the gross visible edge of the tumor, which can make a grossly adequate surgical margin to an inadequate one. Therefore, it is believed that the gross examination of surgical margin is not adequate. As a result, most of the head neck surgeons prefer to use intraoperative FS to identify this grossly invisible microscopic tumor spread. The advantage of intraoperative identification of inadequate margin is that surgeons can revise the inadequate margin immediately. However, the benefit of such revision of margin is controversial. Only one study suggests that it improves the overall survival/locoregional control, whereas all of the other studies failed to prove the same.,,,, The impact of FS-guided revision of margin on further adjuvant treatment plan is also controversial. A study recommended that tumor “cut through” actually reflects biologically aggressive tumor, and all such patients should receive adjuvant RT even if the margin is revised. However, a recent study from Canada challenged such recommendations. This study found that revision of margin after tumor cut through is an adverse prognostic factor, its impact on cancer control and survival is mainly pronounced in patients with regional metastatic disease. When the patient does not have any regional metastatic disease, initially positive margin revised to negative does not have any prognostic significance. This study suggested that adjuvant RT may be avoided in this subgroup of patients who do not have any other adverse prognostic factors requiring adjuvant RT. In our institute, if FS of the revised margin does not show any tumor, we label it as a “free” margin. In such patients, the choice of adjuvant treatment depends on other prognostic factors rather than the margin status. Intraoperative FS is utilized due to the perception that microscopic spread is very common. Presence of such microscopic spread may alter the margin status from free to inadequate. However, there is only sparsely available literature which discuss about the exact incidence of such microscopic spread. In our previous study, we reported that microscopic disease changed the margin status in 5.6% (8/143) of patients. However, that study had a small sample size, and it included all the sub-sites of head and neck region. The present study, which is exclusively for OSCC with a larger sample size, shows microscopic spread can change the gross margin status in 5.2% of patients. This is almost similar to what we reported in the previous study. One of the main aims of this study was to determine the role of FS for assessment of margin in OSCC. Overall, 232 patients had one or more inadequate margin in the entire specimen. Apparently, FS was quite accurate to identify inadequate mucosal and soft tissue margin (accuracy, sensitivity, and specificity were 95.4%, 73.7%, and 100%, respectively). However, this high accuracy and sensitivity is misleading. This is because a majority of these patients had grossly inadequate margins (<5 mm), and FS was un-necessary for these patients. One of the interesting finding in the study was, no revision of margin was performed despite 25 patients had inadequate margins detected on FS. In all these 25 patients the margins were close (1mm to 4mm). We reviewed the surgical notes of these 25 patients. In 7 patients the intraoperative decision of not to revise the margin was taken to avoid significant surgical morbidity. In 18 patients the reasons were not mentioned. Probably, controversy regarding impact of close margin on disease outcome has influenced the surgeons to take such decision, but considering the fact that it may lead to change in adjuvant treatment plan in some of these patients, this strategy is not acceptable. Moreover, when the surgeon has already made his mind about non-revision of a particular margin, FS of such margin is quite unjustified. The cost of FS for each patient in our study was INR 11052 (USD 184.2). A study from the US reported the cost of FS for assessment of margin in head and neck cancer is USD 3123 (INR 187380) per patient. This variability of the cost of FS between the two studies cannot be compared as the economic status of India and US is quite different. However, it is worthwhile to mention here, in the study of DiNardo et al., average 5.25 margins were assessed for 1 patient, which increased both the direct and indirect cost. In our study, average two margins were assessed for 1 patient. We feel performance of FS for too many margins un-necessarily increases the cost burden to the patient without any significant benefit. In fact, despite doing FS for lesser number of margin, the sensitivity of FS in our study (73.7%) was much higher than the reported 25% to 34% sensitivity by other studies.,, This higher sensitivity in our study may be attributed to performance of FS from entire specimen rather than the surgical cavity. FS from the entire specimen allows gross examination of the surgical margins both by the surgeons and the pathologists, whereas sampling from the surgical cavity allows gross examination by the surgeons only. This repeated gross examination increases the sensitivity of the procedure by decreasing sampling error. The activity-based cost-benefit analysis was calculated for FS assessment of margin. As most studies failed to show that FS improves overall survival or locoregional control,,, we have considered the possible impact of FS on adjuvant therapy for cost-benefit calculation. Though the cost of FS was very low in our country as compared to the previous study by DiNardo et al. still the cost benefit ratio was very poor (12.2:1). In our knowledge, this is the first study that has actually calculated the cost-benefit ratio of FS for the assessment of margin in OSCC, which may be relevant in countries with a large pool of oral cavity cancers and limited resources. Although a study by DiNardo et al. has mentioned that the cost-benefit ratio of FS for assessment of surgical margin for head and neck cancer as 20:1, the methodology was not acceptable. They calculated total cost of FS for the entire cohort of 80 patients. As 4 patients benefitted from performance of FS, they concluded that the cost-benefit ratio was 20:1. However, to calculate the cost-benefit ratio, it is important to assess the benefit in term of cost, not in the number of patients who benefitted. Because FS carries a poor cost-benefit ratio, what can be an alternative for intraoperative assessment of margins? In our previous publication, we reported that achievement of gross margin of 7 mm obviates the need for FS. Any margin that is grossly less than 7 mm can be intraoperatively revised to achieve adequate tumor free margin on final pathology report. In the present study, FS identified 40 out of 65 patients whose margins became inadequate owing to microscopic spread of disease. Using the 7 mm criteria, gross examination (taking pathologist's grossing report) alone could have reported 28/40 to be inadequate margin. Hence, margin revision according to gross examination alone could have benefitted 70% (28/40) of those patients who apparently derived benefit exclusively from FS. Moreover, FS missed inadequate margins in 57 patients. Of these, 25 patients had grossly adequate margin (>5 mm) but became inadequate owing to microscopic spread. Surprisingly, 32 (2.6% of 1,237) patients had grossly inadequate margin (<5 mm) but not sampled by the pathologist (sampling error). It is quite obvious that mere gross examination of the entire specimen could have identified majority of the inadequate margins. Hence, this study also reiterates our previous observation that recommended gross examination as alternative to FS. Contrary to popular belief, inadequate soft tissue and mucosal margins owing to microscopic spread of disease beyond gross disease is rare in OSCC. FS when performed for assessment of margin status bears poor cost-benefit ratio. Meticulous gross examination of the entire surgical specimen is pivotal in identifying majority of inadequate margins. Kovacs AF. Relevance of positive margins in case of adjuvant therapy of oral cancer. 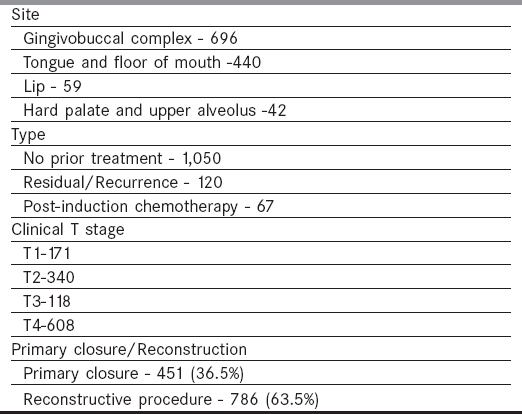 Int J Oral Maxillofac Surg 2004;33:447-53. Pathak KA, Nason RW, Penner C, Viallet NR, Sutherland D, Kerr PD. Impact of use of frozen section assessment of operative margins on survival in oral cancer. Oral Surg Oral Med Oral Pathol Oral Radiol Endod 2009;107:235-9. Scholl P, Byers RM, Batsakis JG, Wolf P, Santini H. Microscopic cut-through of cancer in the surgical treatment of squamous carcinoma of the tongue. Prognostic and therapeutic implications. Am J Surg 1986;152:354-60. DiNardo LJ, Lin J, Karageorge LS, Powers CN. Accuracy, utility, and cost of frozen section margins in head and neck cancer surgery. Laryngoscope 2000;110:1773-6. Ord RA, Aisner S. Accuracy of frozen sections in assessing margins in oral cancer resection. J Oral Maxillofac Surg 1997;55:663-9; discussion 1997;669-71. Ribeiro NF, Godden DR, Wilson GE, Butterworth DM, Woodwards RT. Do frozen sections help achieve adequate surgical margins in the resection of oral carcinoma? Int J Oral Maxillofac Surg 2003;32:152-8. Mishra A, Datta S, Malik A, Garg A, Nair D, Nair S, et al. Role of microscopic spread beyond gross disease as an adverse prognostic factor in oral squamous cell carcinoma. Eur J Surg Oncol 2017;43:1503-8. Kwok P, Gleich O, Hubner G, Strutz J. Prognostic importance of “clear versus revised margins” in oral and pharyngeal cancer. Head Neck 2010;32:1479-84. Patel RS, Goldstein DP, Guillemaud J, Bruch GA, Brown D, Gilbert RW, et al. Impact of positive frozen section microscopic tumor cut-through revised to negative on oral carcinoma control and survival rates. Head Neck 2010;32:1444-51. Chaturvedi P, Datta S, Nair S, Pawar P, Vaishampayan S, Patil A, et al. Gross examination by the surgeon as an alternative to frozen section for assessment of adequacy of surgical margin in head and neck squamous cell carcinoma. Head Neck 2014;36:557-63.